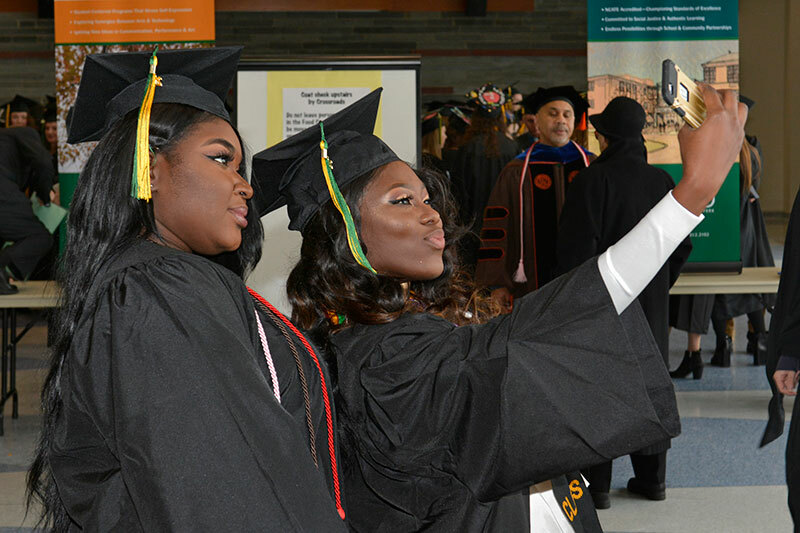 Gloria Ampofo (left) and Porcia Asiedu prepare to celebrate their accomplishments at Commencement on Dec. 17. 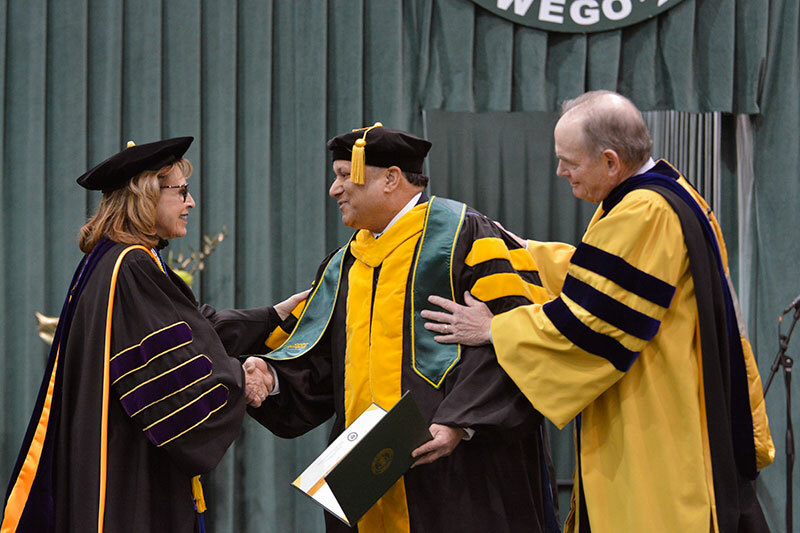 More than 380 students eligible to receive bachelor's and master's degrees, as well as advanced certificates took part in the ceremonies in Marano Campus Center convocation hall and arena. Broadcasting and mass communication major Aaron Roth leaves no doubt how he feels about participating in Commencement, a day of pomp and circumstance to celebrate the years of effort students have put in toward their degrees. 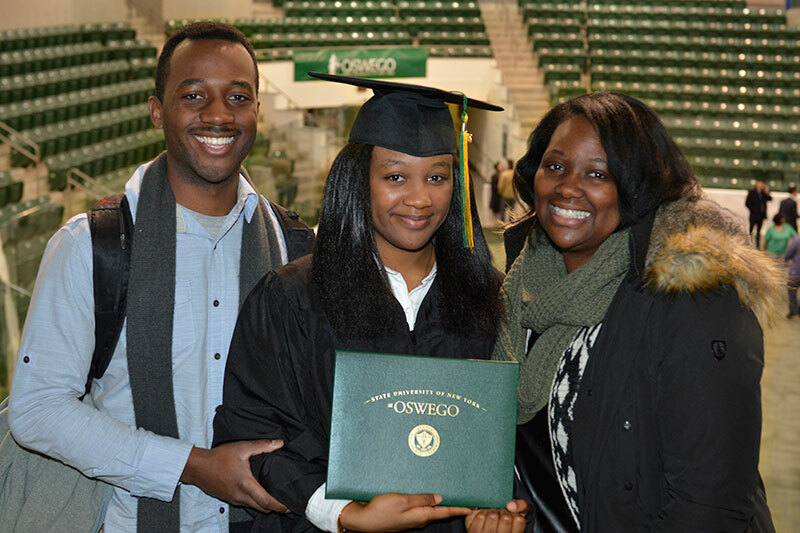 Finance major Natasha Hall (center) beams as her brother and mother help celebrate her achievement Dec. 17 at Commencement. Physics faculty member Alok Kumar (center) accepts congratulations from college President Deborah F. Stanley and Walter Roettger, interim provost and vice president for academic affairs, on his Distinguished Teaching Professor designation, one of the State University of New York's highest honors. Kumar was one of only eight faculty in the system approved late last year by the SUNY Board of Trustees as earning a distinguished honor in professorship, teaching or service. 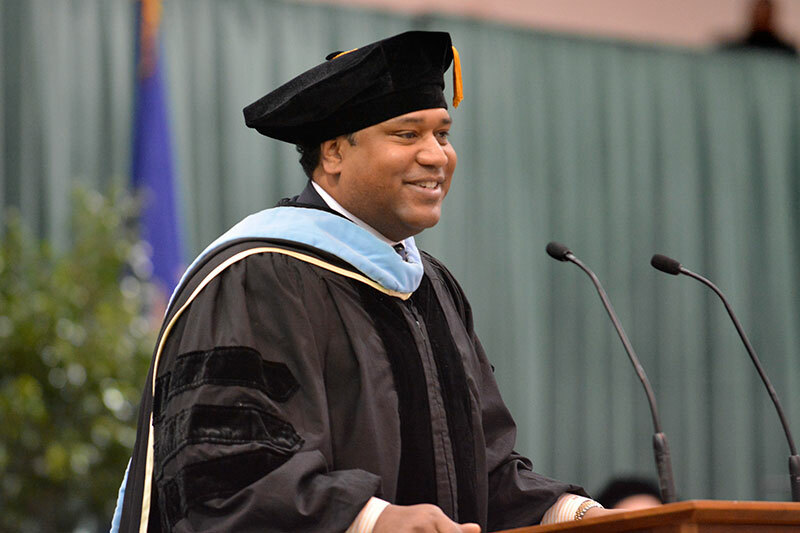 Dr. Damon A. Williams, senior vice president and chief education officer of the Boys & Girls Clubs of America, delivers the keynote address at December Commencement. "You can overcome the challenges and the fear of today, but you have to push through to the other side, Williams told the candidates for graduation. "You have to have a mindset that you can do anything, you have to have a belief that you can accomplish more, and you have to develop a plan of action that you follow with rigor, discipline and focus, relentlessly overtime … just as you did to get to this point in your lives today." 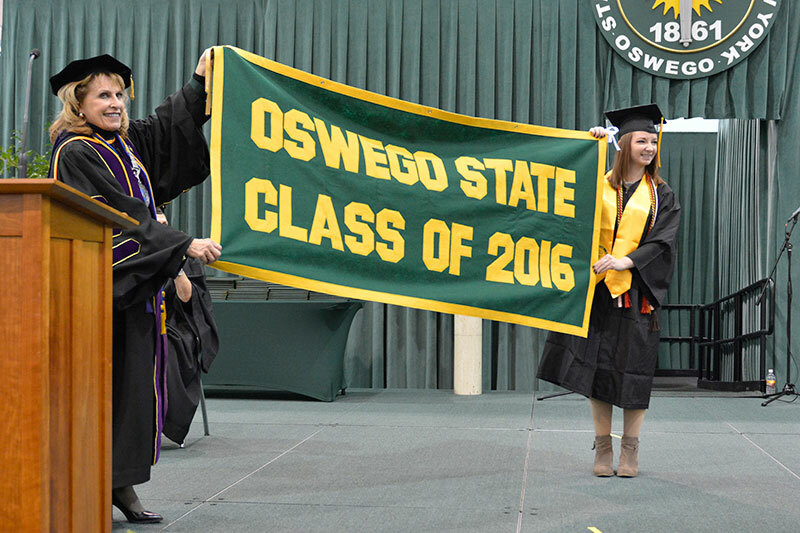 College President Deborah F. Stanley (left) accepts the class banner from graduating senior Emily Pease, a public relations major. 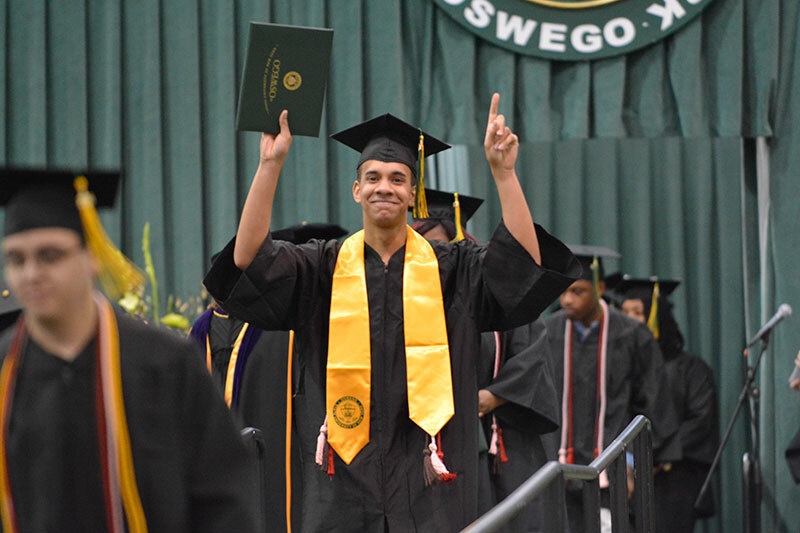 December graduates completed the new alumni class of 2016 following earlier Commencement ceremonies in May. State Assemblymen Will Barclay (second from left) and Robert Oaks (right) join college President Deborah F. Stanley (left) as they present Assembly citations Dec. 7 in Culkin Hall recognizing the SUNY Chancellor's Awards for Excellence in Classified Service for (from left) Angela Galvin of Extended Learning, and for Professional Service to Betsy Oberst of Alumni and Development, Kathleen Pagano of Financial Aid and Katharine Dutton of Campus Technology Services. 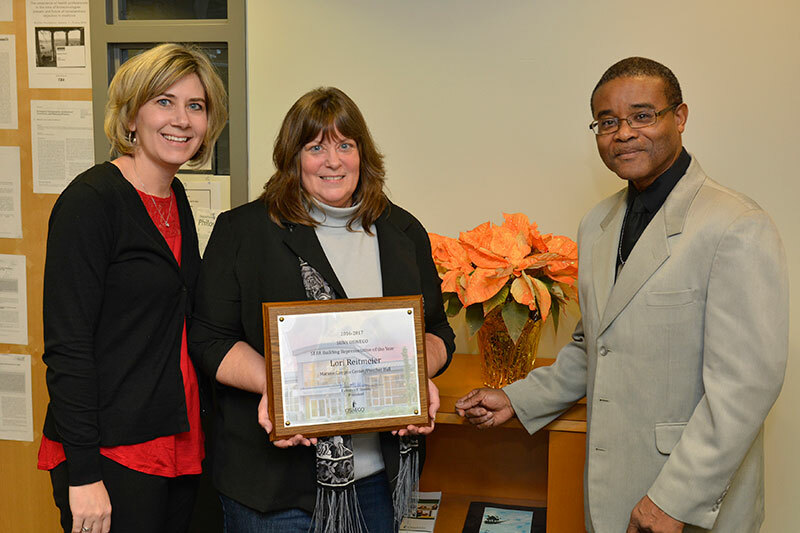 Lori Reitmeier (center), secretary at the Interdisciplinary Programs and Activities Center in Marano Campus Center, accepts recognition for her State Employees Federated Appeal (SEFA) Building Representative of the Year award. 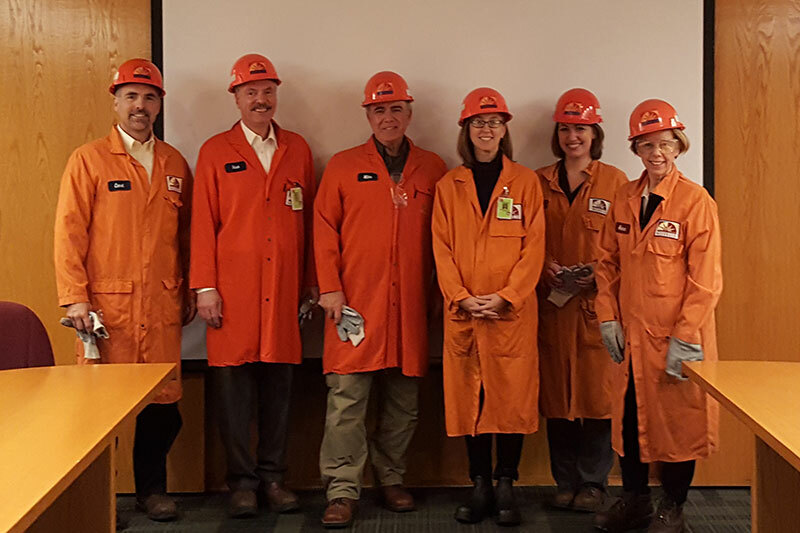 Making the presentation are chemistry staff member Kristin Gublo, who convenes the college's SEFA Committee on behalf of President Deborah F. Stanley, and Howard Gordon, executive assistant to the president, a longtime leader of the annual effort. 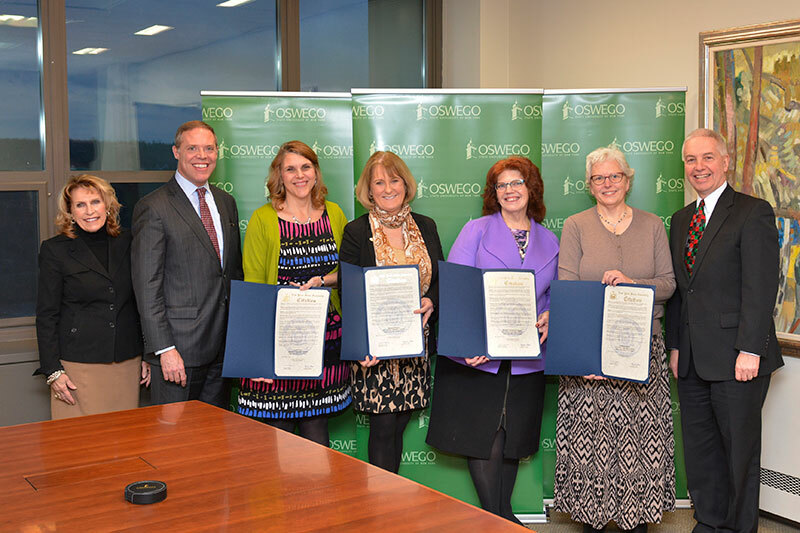 SUNY Oswego's part in the campaign contributes tens of thousands of dollars a year to the collective effort of all state employees in New York, which donates millions to charitable organizations around the region, nation and the globe. 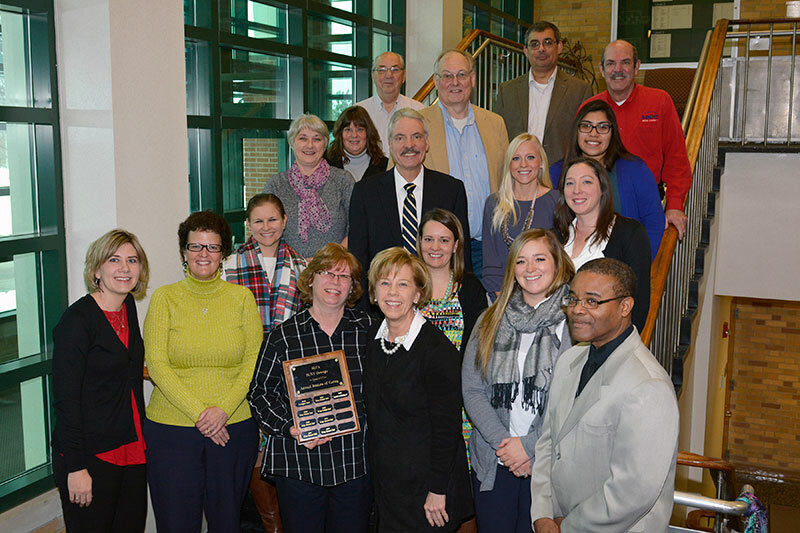 College employees working in Rich Hall and Building 20 proudly display their plaque for donating the most popular basket in the SEFA 2016-17 Baskets of Caring fundraiser. Their "Wreath of Riches" basket, which generated $487 in "votes," was among 21 entries from departments across campus, all packed with goodies on various themes. 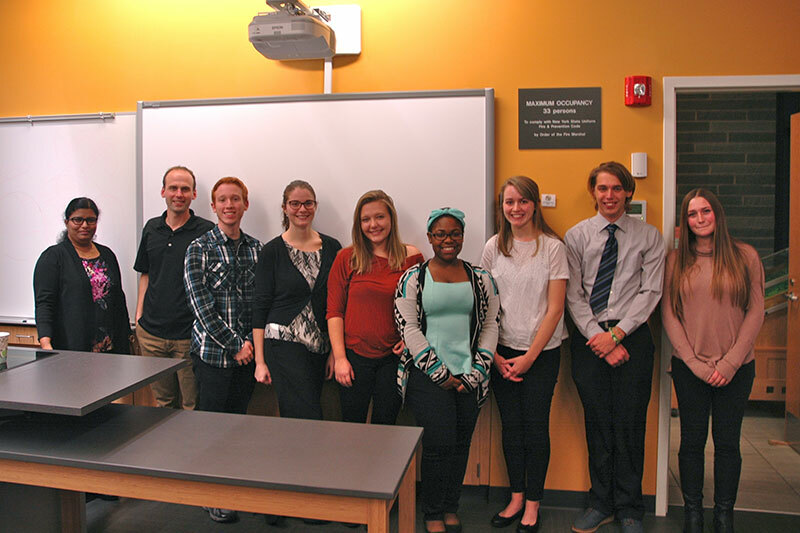 In voting for their favorites, Marano Campus Center passers-by contributed $3,612 to the annual charitable campaign. Making the presentation are chemistry staff member Kristin Gublo (front left), who convenes the college's SEFA Committee on behalf of President Deborah F. Stanley, and Howard Gordon, executive assistant to the president (front right). 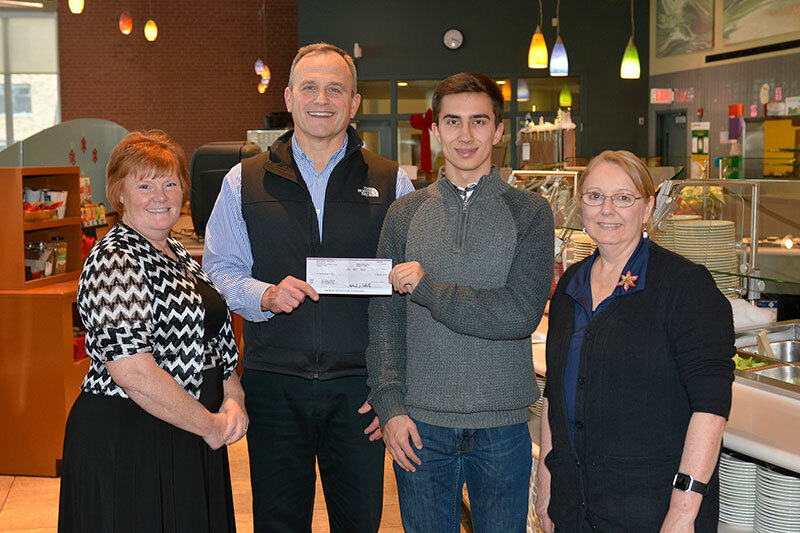 Rob Scott (second from left), visiting assistant professor of marketing and management, accepts a Dec. 15 Miss-A-Meal donation of $4,698.97 on behalf of Make-A-Wish Central New York, which grants the wishes of children diagnosed with life-threatening medical conditions. From left are Ruth Stevens, director of residential dining in Auxiliary Services; freshman business administration and finance dual major Alexander Melas, coordinator of the Miss-A-Meal event for the Student Association; and Ann Lloyd, cashier at SUNY Oswego's Lakeside Dining Hall. 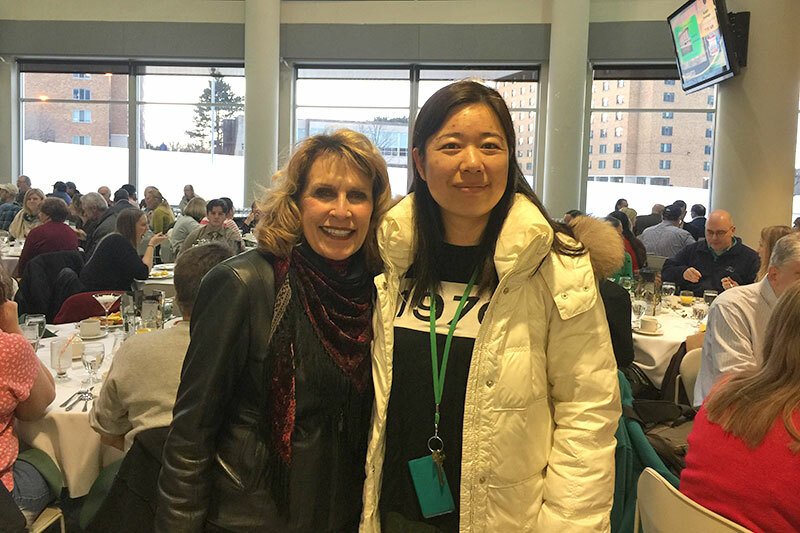 In cooperation with Residential Dining Services, students twice annually miss a dining hall meal, with proceeds from the savings donated to a charity of their choice. This fall's event was Dec. 1. 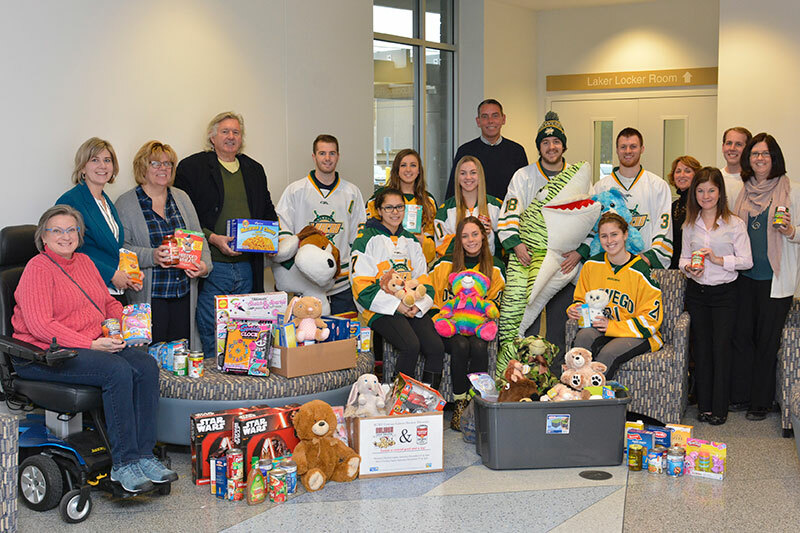 Members of the SUNY Oswego men's and women's hockey teams join college employees and representatives of area charitable organizations in showing off some of the proceeds of the hockey teams' Dec. 5 food and toy drive. The jersey-wearing players (standing from left) are Kenny Neil, Amber Samonek, Lauren Martel, Tyson Bruce and Cedric Hansen, and (seated from left) Victoria Rankin, Brennan Butler and Kate Randazzo. Others (from left) are JoAnn Locy, director of the Human Concerns Center; chemistry department staff member Kristin Gublo, who convenes the college's SEFA Committee; Helen Hoefer, Catholic Charities director for home- and community-based services; Robert McCarey, a Human Concerns board member; Patrick Dewine executive director of the United Way of Oswego County; Human Resources staff member Nancy Concadoro, a member of the SEFA Committee; Alison McGrath, resources development director for United Way; senior public relations major Ryan Kanavy, a campaign intern for United Way; and Career Services staff member Christy Huynh of the SEFA Committee. 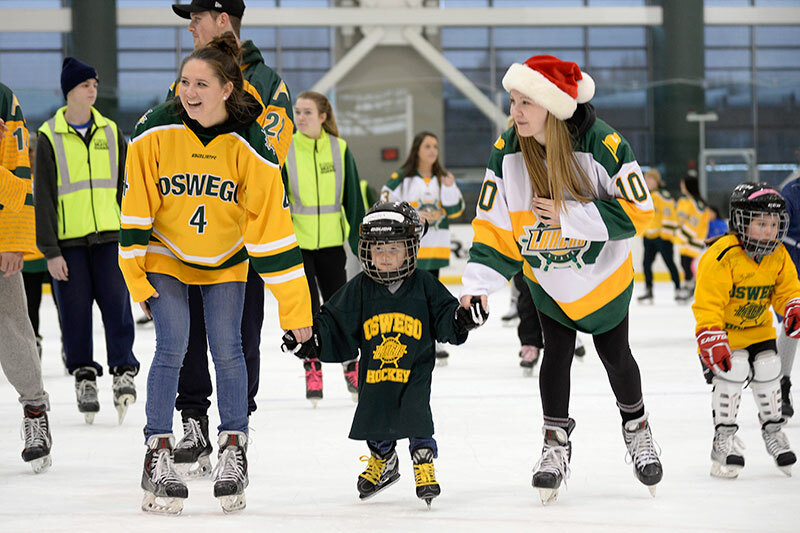 Lakers women's hockey players Sarah Grupp (left) and Eryn Stewart join 3-year-old Hunter Stone to navigate the annual Holiday Skate with the Lakers fundraiser Dec. 11 at Marano Campus Center arena to benefit the local United Way as part of the college's annual commitment to the State Employees Federated Appeal. 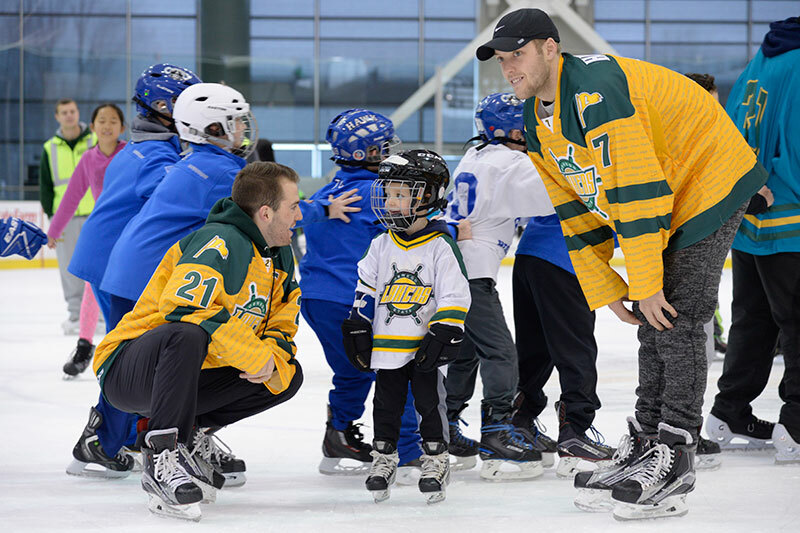 Senior Laker men's hockey players Kenny Neil (left) and Shawn Hulshof consult with Ryan Battelle, 4, as a conga line of young skaters makes its way across the Marano Campus Center arena's ice Dec. 11 during Holiday Skate with the Lakers. 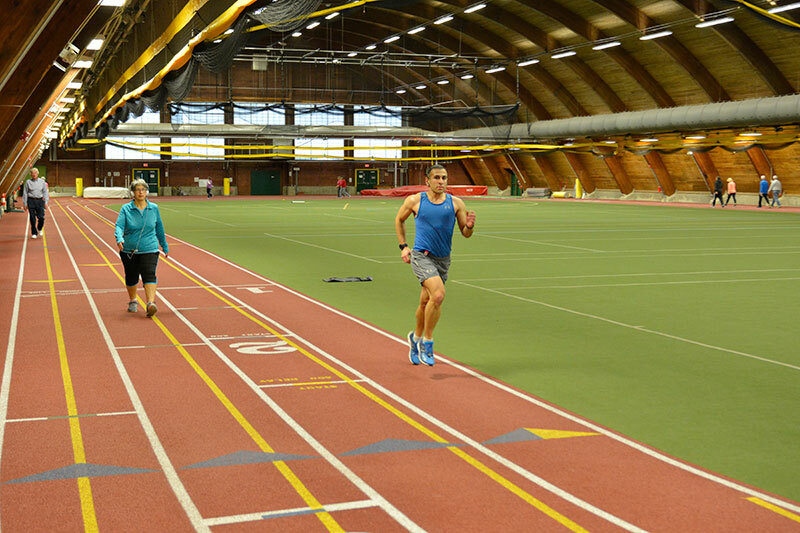 Runner Chris Palian, a Campus Technology Services support professional, shares the Romney Field House track with walkers Jan. 17 during Cruisin' the Campus. Other Cruisin' opportunities included cheering at NCAA athletic events, viewing planetarium shows, hiking Rice Creek, browsing the College Store, utilizing Penfield Library and more. 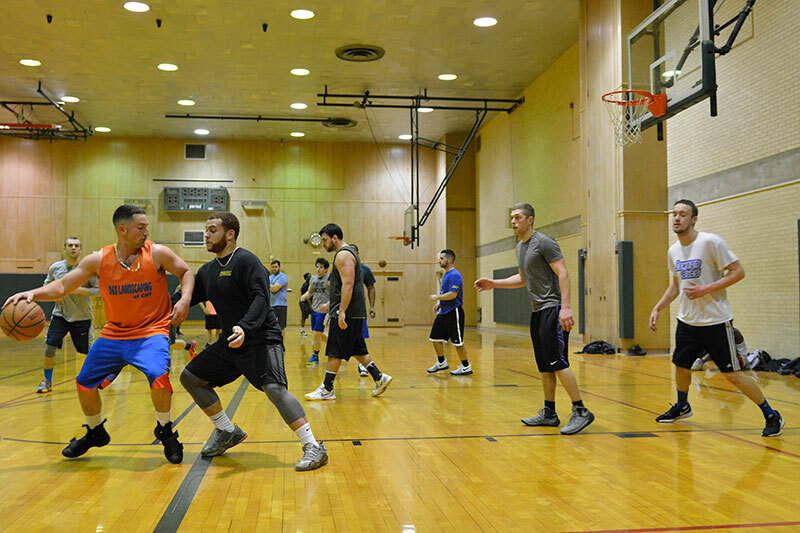 Basketball enthusiasts from the community and the college enjoy open hours Jan. 17 in Lee Hall during Cruisin' the Campus, taking advantage of President Deborah F. Stanley's invitation to use college recreational facilities during winter break. 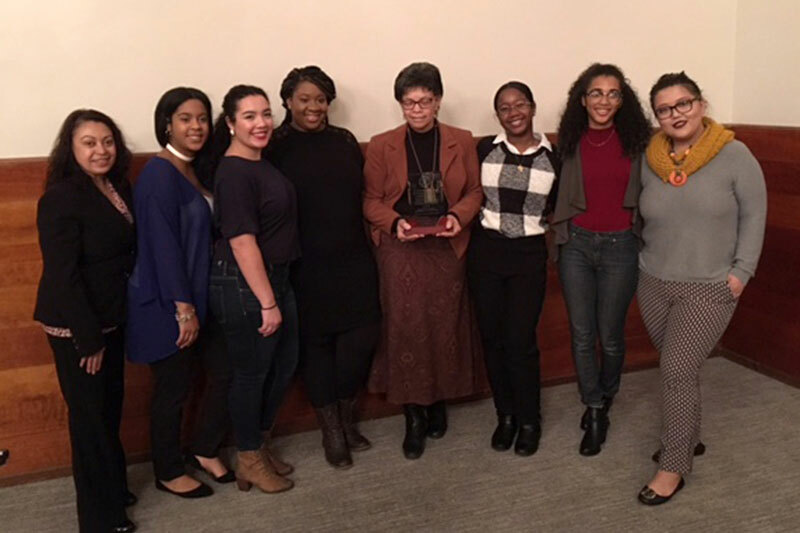 At a workshop on implicit bias titled "It Depends on the Lens," co-host Adrienne McCormick (left), dean of the College of Liberal Arts and Sciences, speaks Jan. 19 in Sheldon Hall ballroom with Cornell Interactive Theatre Ensemble organizers (from left) Vivian Relta, director and senior facilitator; Jumoke Warritay, associate director; and Dane Cruz, artistic and managing director. Based on research on unconscious bias, the CITE troupe performed a case study scenario involving an academic hiring committee, then those attending explored how gender, race and other kinds of stereotypes can, even outside one's awareness, work against otherwise qualified candidates for academic positions. 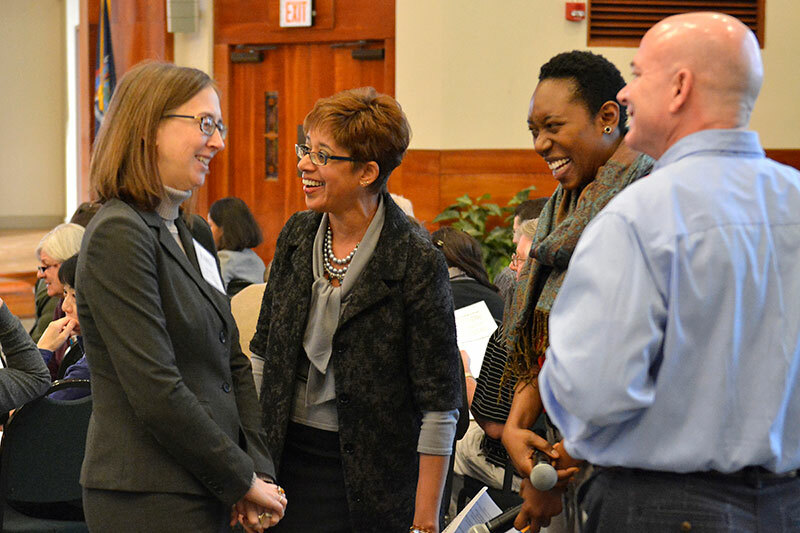 In a small-group activity, workshop attendees brainstormed ideas for improving recruitment of diverse faculty at SUNY Oswego. Preety Tripathi of the mathematics faculty and Marianne Hromalik of electrical and computer engineering also served as hosts. 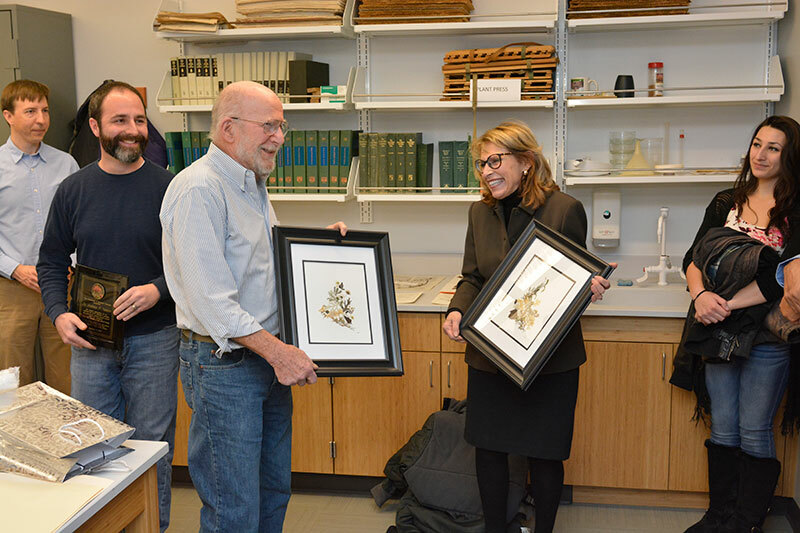 Andrew Nelson, professor emeritus of biological sciences, accepts framed displays of dried flowers Dec. 9 from college President Deborah F. Stanley in recognition of his volunteer contributions in making the herbarium in Room 306 of the Shineman Center ready for scientific inquiry. Nelson has led a faculty-student project to catalog and, in some cases, repair specimens among the plant museum's more than 50,000 items. At left are biological sciences faculty members Andrew McElwain and department chair James MacKenzie; at right is senior zoology major Alyssa Cassar. Following his introduction to the Lakers' starting lineup, Jamir Ferebee has begun to excel, especially in the past week. The junior led the team in scoring in two wins against conference opponents. During a midweek trip to New Paltz, Oswego downed the Hawks, 81-52, behind Ferebee's 19 points -- in just 20 minutes of court time -- on 7-of-9 shooting from the field. He made 5 of 6 three-pointers. 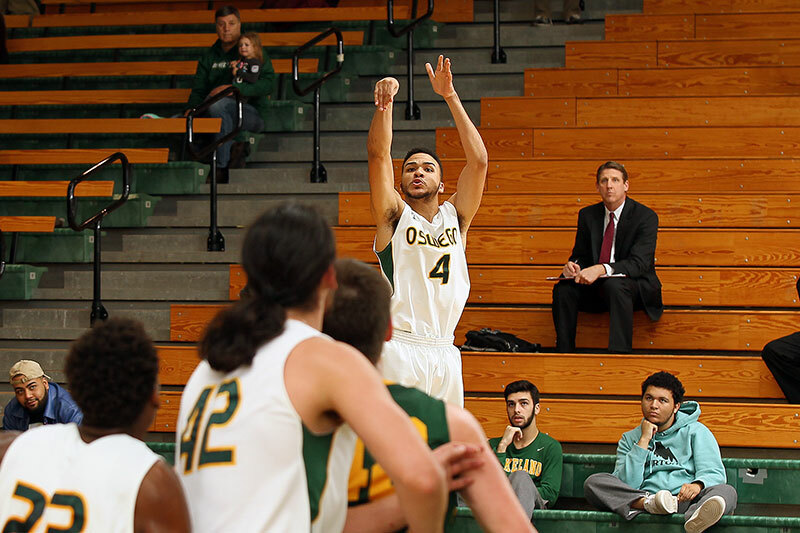 Ferebee led a 104-94 win for Oswego over SUNY Athletic Conference opponent Cortland. The Staten Island native contributed 21 points, four rebounds and five assists. Men's basketball is now 13-4 this season and 9-1 in the SUNYAC, tied for the conference lead with Brockport. The Lakers are scheduled to tip off against Brockport at 5:30 p.m. Friday, Jan. 27, in Laker Hall's Max Ziel Gymnasium. 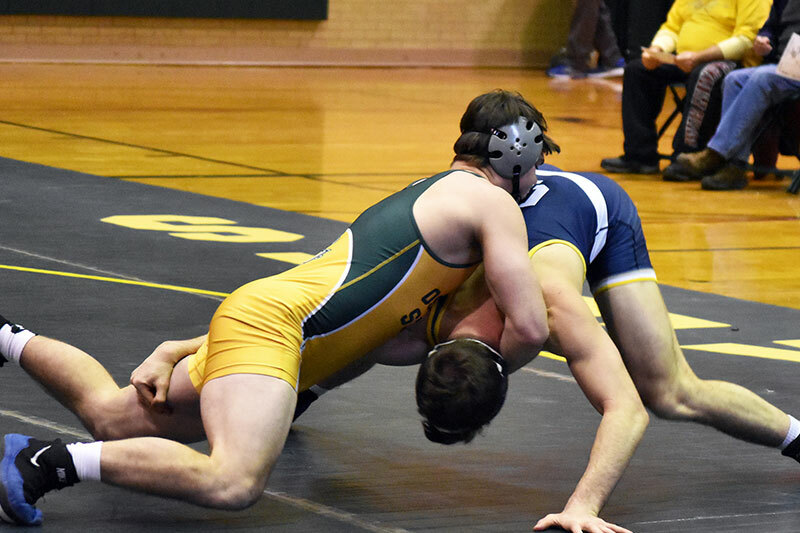 Oswego plays again the next day, hosting Geneseo at 2 p.m.
Jordan Bushey (pictured against Ithaca) won all three of his matches on Saturday at the ECWC (Empire Collegiate Wrestling Conference) Championships, hosted by Oswego in Laker Hall. The wrestler, nationally ranked in the 184-pound weight class, opened the day with a 17-3 decision over Brockport's Richard Mills. In a semifinal matchup against RIT's Nick Greenquist, the freshman played it closer and won by a point, 3-2. In the title bout against Cortland's Duely Espinal, Bushey wrestled to a 4-1 win. 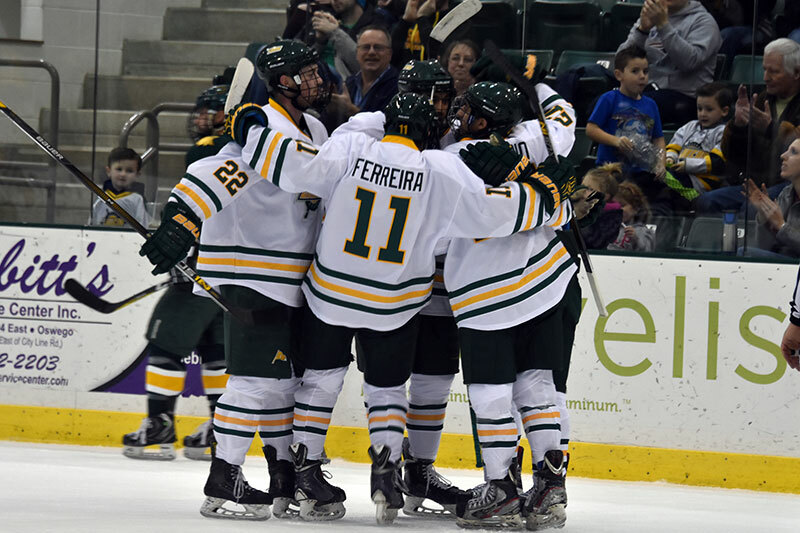 Oswego State skated to a 1-0-1 week in men's hockey, including a five-goal comeback against the No. 5/6 Geneseo Knights on the back of Joey Davies. The senior forward recorded two four-point games, the first in a 10-1 win over Brockport on Friday. He tallied a couple of assists and a pair of goals, including one short-handed. On Saturday, Davies provided spark to the Laker offense. After falling behind, 5-0, to the nationally ranked Knights, Davies got Oswego on the board with a couple of goals late in the second period. He followed up by assisting on the team's third goal just 24 seconds into the final period of regulation, making it a 5-3 game. Davies' last goal of the day, marking his first career hat trick and ninth goal of the year, came in the seventh minute of the final period to cut the Knight's lead to one. Stephen Johnson scored the final goal for No. 3-ranked Oswego with just 3.3 seconds remaining to earn the tie. Goaltender Matt Zawadzki (not pictured) earned a win and a tie, playing nearly 104 minutes and maintaining a .917 save percentage during the week. In a 10-1 win against Brockport on Friday, the Fort Mill, South Carolina, native stopped 15 shots, while nearly collecting a shutout. Although not starting on Saturday against Geneseo, the Lakers ended up relying on Zawadzki in the second, third and overtime periods. The senior goalie allowed only two goals in about 44 minutes of action to help the Lakers earn the eventual 5-5 tie. When the Lakers needed him the most, in the third period and overtime, Zawadzki hunkered down and allowed his teammates to climb back into the 5-0 game. 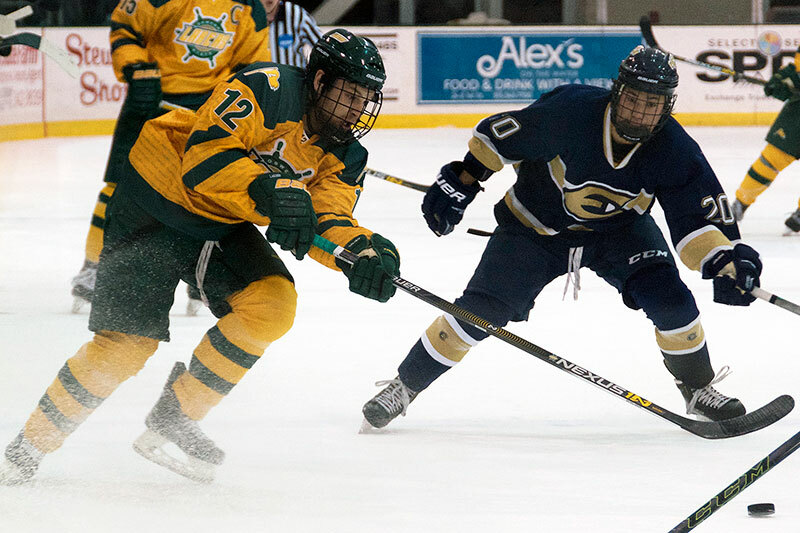 The Lakers next are scheduled to face off with Cortland at 7 p.m. Friday, Jan. 27, at Marano Campus Center arena.